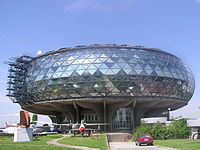 You can't miss its large glass-encased round structure when approaching the Belgrade Airport. At this aviation museum, you can see a number of military and civilian aircrafts which belonged to the Yugoslav armed forces and played a key role in decisive battles. The collection displays more than 200 aircrafts and some types of aircraft is the world’s only remaining, such as Fiat G.50.